France and Paris Saint-Germain star Kylian Mbappe ranks Chelsea winger Eden Hazard as the best player he has faced in 2018. Mbappe won the inaugural Kopa Trophy for the best under-21 player in the world on Monday, while he also finished fourth in the running for the Ballon d'Or after his exploits for PSG and World Cup-winners France. 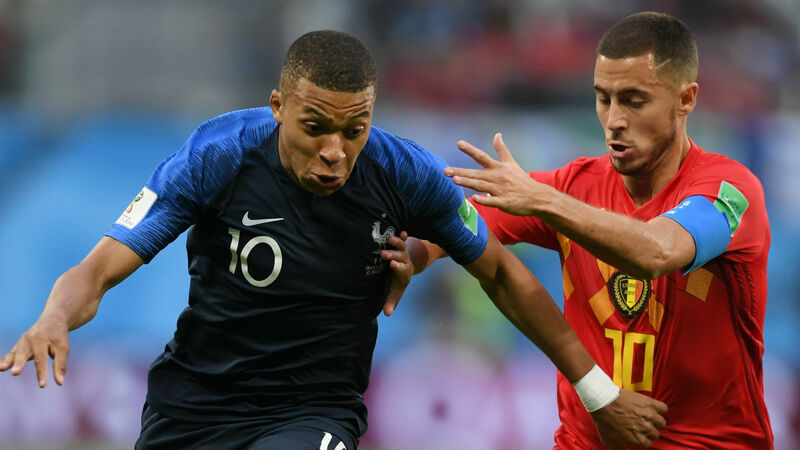 It was at that tournament in Russia where Mbappe came up against Hazard, as France defeated Belgium 1-0 in the semi-finals. Mbappe was particularly impressed with Hazard's sheer pace, while he also commended him for not playing with an ego, always appearing willing to pass the ball to a team-mate. "He is the player I played against this year that impressed me the most," Mbappe told France Football. "With Belgium, in the World Cup semi-finals, he had been impressive while still respecting the game. When he has to pass the ball because the game commands it, he does it without any qualms. "I was sometimes five metres away from him and I was amazed by his speed of execution, with the ball sticking all the time to his foot, constantly processing information with his head still up. There is no space he does not see."